2D materials have almost completely renovated the outlook of material science. 2D materials are trending as a preferential choice in optoelectronics, energy storage, energy conversion, and for various biomedical applications. Captivating properties and a far-stretching application scope of graphene have re-sensitized the class of 2D materials (Novoselov et al., 2004). 2D materials have one dimension in nano range below 100 nm and possess a planar structure. The planar structure endows 2D materials with a high surface area, which boost its aptness for various healthcare applications like drug delivery, gene vector, sensor applications, etc (Fig 1). Fig 1. Biomedical applications of 2D materials. Image courtesy Mohanan P V.
High surface area also opens the door to functionalization that further refines its application caliber. The 2D class of materials accommodates materials of diverse chemical composition, including carbon-based materials (graphene, graphene oxide (GO), reduced graphene oxide [rGO]), 2D clay materials, black phosphorous (BP), 2D Transition metal dichalcogenides (TMDs), 2D transition metal oxides (TMOs), graphitic carbon nitride (g-C3N4), and hexagonal boron nitrides (hBN). 2D material research is gaining much recognition for futuristic applications in both opto-electronics and biomedical applications. New materials have been developed and added to the list of 2D materials. Among them are relatively new members such as graphane, graphyne, graphdiyne, fluorinated graphene, and elemental 2D materials such as silicene, germanene, arsenene, and antimonene. Similar to other dimensional nanomaterials, 2D materials can be synthesized by either a top-down or bottom-up approach. 2D layers can be exfoliated from the bulk structure with different top-down techniques such as mechanical, thermal, liquid, ion-intercalated, or surfactant-mediated exfoliation. More control over the elemental composition and ratio are achieved using a bottom-up approach, which includes wet synthesis and chemical vapor deposition techniques (CVD) (Qiu, Y et al., 2016). Different reaction parameters like reaction time, aging time, temperature, pH, etc., greatly influences its size, shape, and crystallinity. In brief, synthesis parameters significantly influence the physico-chemical properties of the 2D materials and, therefore, it is mandatory to choose the synthesis method according to the application of interest. 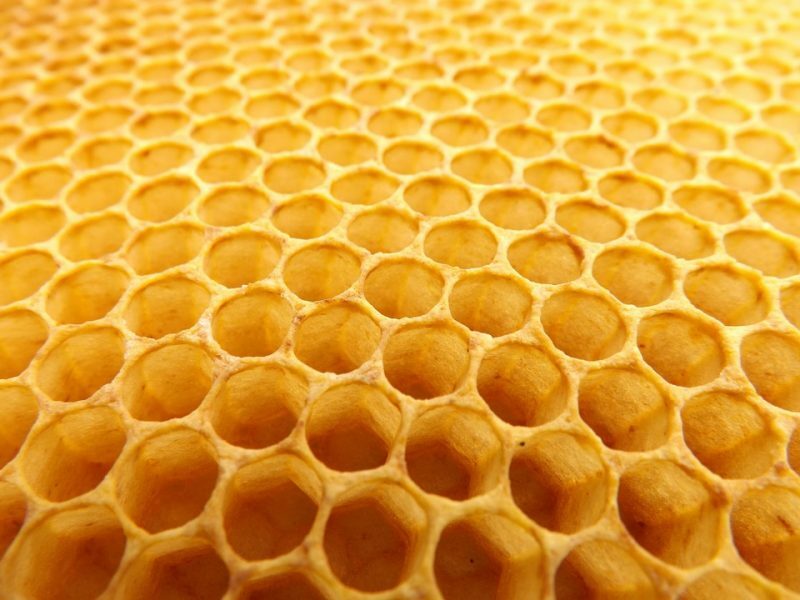 The honeycomb-structured graphene with a single layer of sp2 hybridized carbon atoms is actually responsible for the current fame of 2D materials. The interesting characteristics of graphene impart high functionality to graphene especially in electronics, mechanical and optical applications. The oxidized form of graphene, GO, being hydrophilic in contrast to graphene, has better applicability in healthcare applications. GO is a widely-used precursor for graphene synthesis. Reduction of graphene with different reducing agents like sodium borohydride, vitamin C, hydrazine, etc., yield reduced graphene oxide (rGO). Initially, much of the 2D material research was concentrated on graphene, GO, and rGO. But now, 2D clay materials notably laponites and layered double hydroxides (LDHs) are gaining momentum as multifunctional materials due to their exceptionally high surface area, ease of functionalization and ion-intercalation proficiency. LDH is sought-after for various applications as catalyst, absorbent, drug-gene delivery vector, ion-exchanger, and polymer composite material (Mishra et al., 2018). 2D TMDs, another interesting 2D material, consist of a transition metal layer sandwiched between two layers of chalcogen atoms. Impressively, the exfoliation of TMDs from bulk to 2D alters the indirect bandgap of TMDs to direct a bandgap which makes them advantageous over zero bandgap graphene for semiconductor applications (Choi et al., 2017). BP, with its puckered honeycomb structure, is presumed as a reliable graphene analog, reasonably due to its tunable direct bandgap, high charge carrier mobility, and anisotropic nature (Yi et al., 2017). 2D TMOs possess multifunctional application capacity, notably in the fields of photothermal therapy, MRI imaging, and drug delivery. Hexagonal boron nitride (h-BN) is reputed as “white graphene” due to structural similarities with graphene. Yet another 2D material, graphitic carbon nitride (g-C3N4) is an organic semiconductor with electronic and structural resemblance to graphene. g-C3N4 is highly stable due to the strong C-N bonds (Liu et al., 2016). Also, its meritorious properties like photo-sensitivity, high photo-absorption properties, with an added advantage of relatively low toxicity, when put together, create an excellent biosensor. The exponential increase in research focused on exploring the potential of 2D materials for healthcare applications compel the need for a detailed awareness about the potential toxicity that these materials can possess. The available information about the toxicity of 2D materials is very restricted. Much more focused toxicity evaluation is needed with the increasing focus on biomedical aspects of 2D materials. There are reports on toxicity induced by some 2D materials. 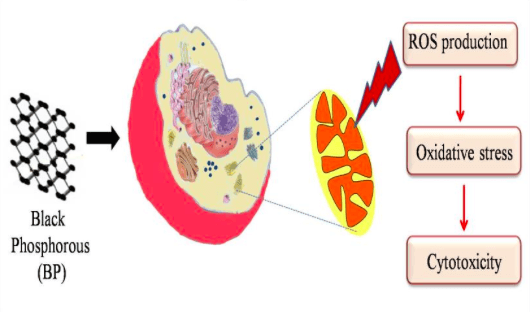 In most cases, elevation in ROS production in due course led to oxidative stress that eventually results in cell damage. Duch et al (2011) reported that GO increased ROS production which eventually leads to apoptosis mediated cell death. Even though there are cases of toxicity reported for various 2D materials, proper functionalization can ameliorate the associated toxicity. Similarly, BP induces increased mitochondrial respiration that leads to a hike in ROS production (Fig 2). Fig 2- Bare BP enhanced mitochondrial respiration leading to an increase in ROS production resulting in cytotoxicity. Image courtesy Mohanan P V.
Various functionalizations are done on 2D materials so as to improve its functional properties and biocompatibility while reducing its aggregation tendency and toxicity. Polyethylene glycol functionalized MnO2 showed improved drug loading capacity and photothermal efficiency. 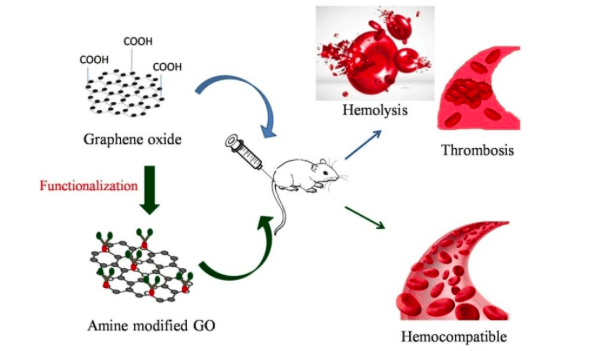 Also, unmodified graphene oxide usually results in DNA damage, hemolysis, thrombosis and ROS production. Amine modification on GO effectively reduced its RBC rupture and hemolysis (Wick et al., 2014, Fig 3). Fig 3- Effect of amine functionalization of graphene oxide. Image courtesy Mohanan P V.
The limiting factor that hinders the scope of black phosphorous for various healthcare applications is its poor stability due to its oxophilic nature. Functionalization is the key to tackle the rapid degradation of BP. Qu et al (2017) reported that TiL4 ligand coordination with BP not only passivated surface degradation but also improved the biocompatibility of BP. The TiL4 ligand coordination with BP reduced oxidative stress compared to bare BP resulting in lowering of oxidative stress and cytotoxicity. Opting appropriate functionalization indeed helps in exploiting the potential of 2D materials. Literature updates suggest that 2D materials, without a doubt, will hold a significant position in futuristic healthcare applications. In this context, much attention has been diverted towards developing new 2D materials with desired functionality and enhanced biocompatibility. 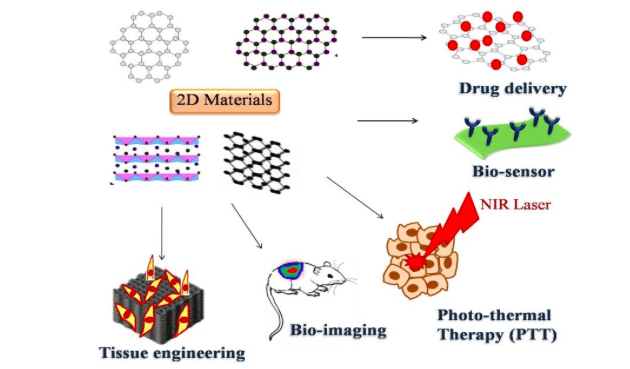 2D classes of materials enriched with materials of diverse chemical composition offer an excellent choice for various healthcare applications including drug delivery, photothermal therapy (PTT), bio-imaging, bio-sensor, tissue engineering, anti-bacterial activity, and as gene vectors. Inherent properties of 2D materials with an added possibility for fine tuning various physico-chemical factors enhance the scope of 2D materials for next-generation healthcare applications. These findings are described in the article entitled 2D materials for next-generation healthcare applications, recently published in the International Journal of Pharmaceutics. This work was conducted by Ashtami Jayakumar, Anju Surendranath and Dr. Mohanan P V from Sree Chitra Tirunal Institute for Medical Sciences and Technology, Trivandrum, Kerala, India. Novoselov, K.S., Fal, V.I., Colombo, L., Gellert, P.R., Schwab, M.G., Kim, K., 2012. A roadmap for graphene. Nature 490 (7419),192. Qiu, Y., 2016. Two-Dimensional materials beyond graphene: emerging opportunities for biomedicine. Nano LIFE 6 (03n04), 1642008. Mishra, G., Dash, B., Pandey, S., 2018. Layered double hydroxides: a brief review from fundamentals to application as evolving biomaterials. Appl. Clay Sci. 153, 172–186. Choi, W., Choudhary, N., Han, G.H., Park, J., Akinwande, D., Lee, Y.H., 2017. Recent development of two-dimensional transition metal dichalcogenides and their applications. Mater. Today 20 (3), 116–130. Yi, Y., Yu, X.F., Zhou, W., Wang, J., Chu, P.K., 2017. Two-dimensional black phosphorus: synthesis, modification, properties, and applications. Mater. Sci. Eng. R: Rep. 120, 1–33. Liu, G., Niu, P., Sun, C., Smith, S.C., Chen, Z., Lu, G.Q., Cheng, H.M., 2010. Unique electronic structure induced high photoreactivity of sulfur-doped graphitic C3N4. J. Am. Chem. Soc. 132 (33), 11642–11648. Omomo, Y., Sasaki, T., Wang, L., Watanabe, M., 2003. Redoxable nanosheet crystallites of MnO2 derived via delamination of a layered manganese oxide. J. Am. Chem. Soc. 125 (12), 3568–3575. Duch, M.C., Budinger, G.S., Liang, Y.T., Soberanes, S., Urich, D., Chiarella, S.E., Campochiaro, L.A., Gonzalez, A., Chandel, N.S., Hersam, M.C., Mutlu, G.M., 2011. Minimizing oxidation and stable nanoscale dispersion improves the biocompatibility of graphene in the lung. Nano Lett. 11 (12), 5201–5207. Wick, P., Louw Gaume, A.E., Kucki, M., Krug, H.F., Kostarelos, K., Fadeel, B., Dawson, K.A., Salvati, A., Vázquez, E., Ballerini, L., Tretiach, M., 2014. Classification framework for graphene based materials. Angew. Chem. Int. Ed. 53 (30), 7714–7718. Qu, G., Liu, W., Zhao, Y., Gao, J., Xia, T., Shi, J., Hu, L., Zhou, W., Gao, J., Wang, H., Luo, Q., 2017. Improved biocompatibility of black phosphorus nanosheets by chemical modification. Angew. Chem. 129 (46), 14680–14685. Ashtami is a research scientist at the Sree Chitra Tirunal Institute for Medical Sciences and Technology. Anju is a research scientist at the Sree Chitra Tirunal Institute for Medical Sciences and Technology. PV is a research scientist at the Sree Chitra Tirunal Institute for Medical Sciences and Technology.